Some growers may make claims that a stressed grape plant will produce better wine. In reality, grapes need to have adequate water to enable systems like photosynthesis, evaporative cooling, and nutrient transport to work properly. 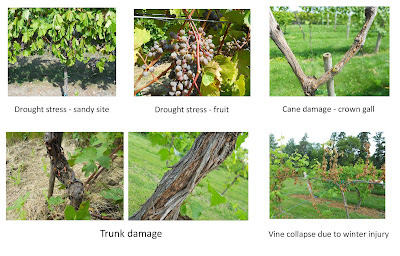 Common symptoms of drought stress in grapes wilting leaves, change in leaf angle (away from the sun), and shriveling fruit. Drought stressed plants are less likely to survive Minnesota winters. Winter injury itself can cause symptoms of drought stress and allow vines to become infected with crown gall. Careful observation of trunks and canes of wilted plants will help to identify if the symptoms are caused by vascular damage, disease, or drought. Grapes can be purchased as bare-root stock or in pots. 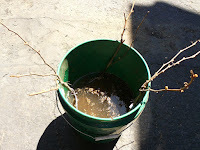 Bare-root plants are dormant and have an When watering the young vines, the root zone should be well saturated. Applying 5 gallons of water over a 3 x 3 foot area is a good estimate for 1 inch of water. established root system that is in balance with the shoot. They must be soaked in water for 3-4 hours prior to planting, but will be less vulnerable to drought stress at planting than potted vines. Plants grown in pots require regular watering until the roots become established and the leaves have acclimated to growing outdoors. It will be worthwhile to monitor these plants daily to ensure they do not suffer drought stress. Young grape vines need regular watering to ensure successful establishment especially at the time of planting and the following two years. Older vines seldom need any watering unless on sandy or other very well drained soils. According to Growing Grapes for Home Use, grapes are best planted in spring and grown in well-drained soil. The amount of organic matter in the soil may influence the growth and vigor of vines by providing access to additional nutrients. Dig a hole large enough to spread out the root system. Cover the roots completely with soil. Create a slight depression around each vine. This will allow water to pool and soak into the soil, saturating the root area and preventing run-off. Mulching is not recommended for grapes because mulch will moderate the soil temperature, often keeping it cooler in warmer months, and grape vines grow best in warmer soil. Young grapes require about ½ to 1 inch of water per week, depending on rainfall, for the first two years during the growing season. By the end of the second growing season, a trunk should be established and your vine is likely to not need additional watering intervention unless specific soil conditions (sandy, well drained) or prolonged drought dictate the need. Apply water only to the root zone. Avoid getting grape foliage wet as this can encourage many grape diseases. Reduce watering young vines going in the fall to encourage the plant to harden off its canes to prepare for winter. Managing weeds near grapevines is critical as weeds compete for water and nutrients as well as harbor potential insect and vertebrate pests. Weeds can be managed by hand-pulling, cultivation (hoeing) or through the use of well-timed herbicide applications. Cultivation and herbicide application before planting is most effective. Combining a pre-emergent herbicide and a broad-spectrum herbicide like glyphosate before planting, and while plants are dormant in subsequent years can be a very effective strategy. Make sure to not apply contact herbicides after the buds begin to grow as grapes are very sensitive and easily damaged by herbicides. Grow tubes can help protect the young, and sensitive vines and are a great tool when is establishing a planting. They can even minimize damage from deer. Hello, Julie - Just read this posting (from last May!) and checked the link to the article on grapes by Emily Tepe and Emily Hoover, and see that they have a publication on grapes but it appears to be available for download only, and not even for Kindle, but I'd really like it in PRINT. Is it available in regular print? Thank you!